One of my long-time loves is puppetry. When I was a child, my mother took me to see one of Tom Tichenor's last plays at the Nashville Public Library. An innovative artist and puppeteer, Tichenor literally wrote the book on puppetry. His legacy has been preserved in the beautiful new downtown library's theatre. Any child can see a wonderful marionette show there for free. 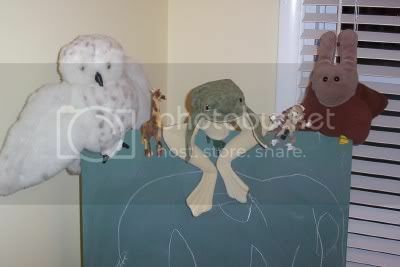 Since I am sewing-impaired, my attempts at making fabric puppets for my son have been limited. Another mom gave me a wonderful tip! Think of all the beautiful stuffed animals you see at yard sales for a quarter. I always want to take them home, but they have so little play value, I just can't justify the clutter. This mom (thanks, Tracy!) cuts a slit in the belly, pulls out the stuffing everywhere except the head, and simply inserts her hand through the new opening. Thanks for passing on this great idea! I'm so glad that I can get a second life out of the stuffed animals in my children's rooms. Saw your article on dollar stretcher. Am definitely coming back.